James loves to draw and so when we were recently asked if he would like to try out some of the KIDS range from BIC I leaped at the chance. I have always found the packaging for BIC products to be bright and eye catching and this range is no different. The fun packaging caught James eye as soon as it arrived and the colours inside are exactly the same. The pens, pencils and crayons all offer a rainbow of bright vibrant colours within each pack. I wondered how the colours would be reflected on paper and if they would offer up the same vibrant colours and we were not disappointed! The colours were just as bright on paper as they look in the pack and James and I both agreed they were really fun and easy to use. James said he loved how easy the pens were to colour in and that they didn't run out even when he used the pens on a big area. I gave the crayons to Evelyn who has just turned 3 and they were ideal for her. The crayons are aimed at kids age 30 months + and are super easy to grip. They don't have paper around them like other crayons I have seen which was a bonus for Evelyn as it meant she didn't have to keep peeling away paper as she used them. 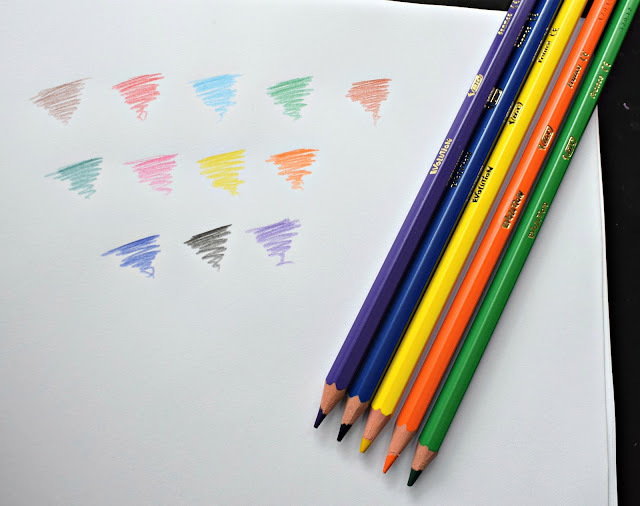 I also loved that the crayons can be sharpened with a regular sharpener! 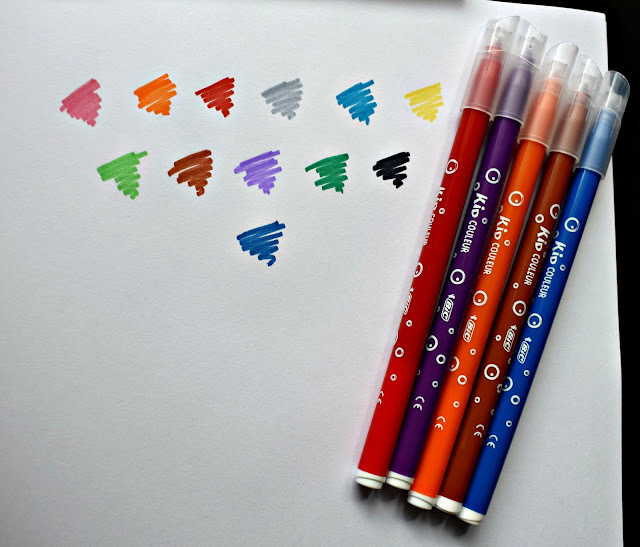 The BIC KIDS Kid Couleur felt tip pens are durable and ultra washable pens with blocked tips. 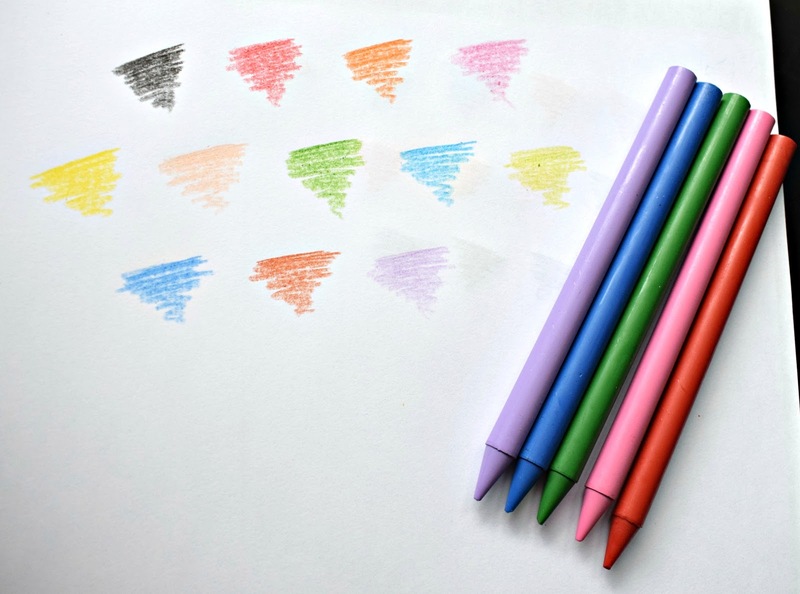 These felt tip pens are perfect for kids to explore their creativity and create vibrant bright drawings and colouring. The BIC KIDS Evolution are ultra resistant, wood free colouring pencils that are ideal for every day use. They have a resistant chew proof lead and barrel making them highly durable. 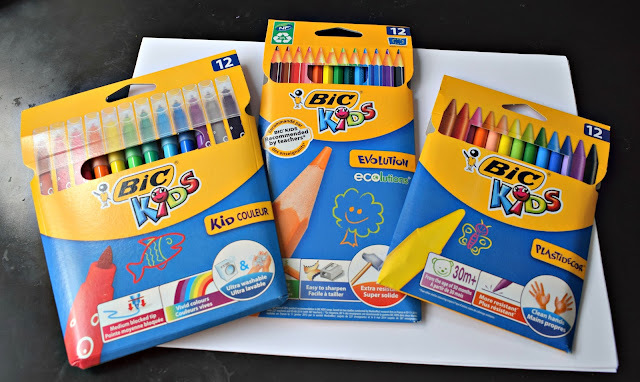 BIC KIDS colouring crayons are ideal for younger children and are easy to hold and grip. They have been recommended by teacher, they are easy to sharper and super resistant to breakage make them perfect for the younger child. The whole range feel like great quality and out of all the colouring items we have these are now the first ones both kids reach for. Even I have been using some of these colours for my adult colouring in book and they are fab. The pencils are great for shading too. If you have children aged between 5 and 11 who love drawing too Mumsnet currently have a competition where your child could win their art work on a billboard in your home town! Its simple to enter, just get your child to draw a picture of anything they want and they post a picture of it HERE in the Mumsnet forum. The competition is open until 6th August 2017 after which 10 winners will be chosen to win their art work on a bill board as well as a £50 BIC bundle. One lucky winner will also be chosen at random to win a £300 voucher! Here is James entry he drew using the BIC KIDS range shown above. 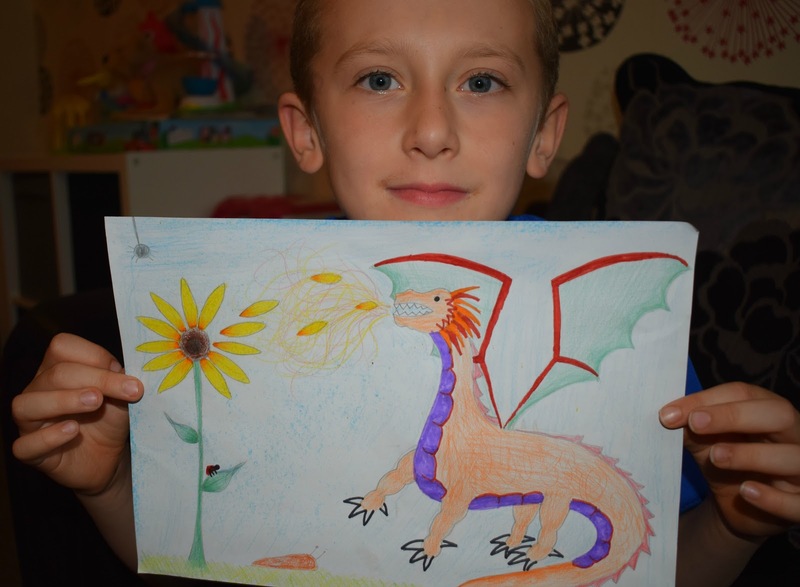 He used the crayons for the sunflower and then the pens and pencils for his dragon. Bic pens are awesome. I love these pens work great and for a long time.